Three days ago, London Fashion Week took the baton from the New Yorkers and this season's British Invasion officially began. From Burberry and Topshop; to Cara Delevingne, Jourdan Dunn and Rosie Tapner; to Naomi Campbell and Kate Moss; Britain has taken the fashion world by storm with its quirky-cool designers dishing out covetable avant-garde and world-famous supermodels. London Fashion Week is one of the most glamorous fashion weeks out of the Big Four, and its recent big-name shows have been giving style mavens all over the world serious sartorial lust. Two shows, Mulberry and Topshop caught my eye and there were some surprising trends that were prominent in both shows. Scroll down for more! Cara totally screams "model of the moment". I mean, who doesn't love Cara? At just 20, she's accomplished a lot for a model : think Model of The Year at the 2012 British Fashion Awards, a Victoria's Secret contract and multiple covers for magazines like W, British Vogue, Industrie, i-D and Australian Vogue etc. 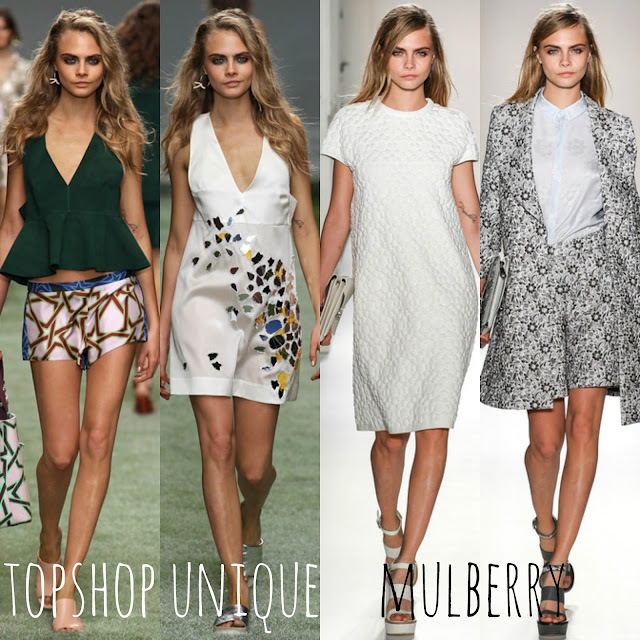 This season, she walked for 8 shows so far including the above Topshop Unique and opening Mulberry. What's better than a British supermodel walking for an equally British label? The Verdict : Topshop. Give me bronzed skin, wind-swept beach-perfect hair and smoky eyed beach glamour any day. Stripes have become a understated yet chic way to make a style statement. Topshop's stripes came in various shades of grey and directions (horizontal and vertical), adorned on separates such as cardigans and thigh-length dresses. At Mulberry, the neutral stripes were more subtle in the form of horizontal sheer panels, a nod to one of F/W 2013's major trends. Simplicity is bliss. The Verdict : Mulberry. 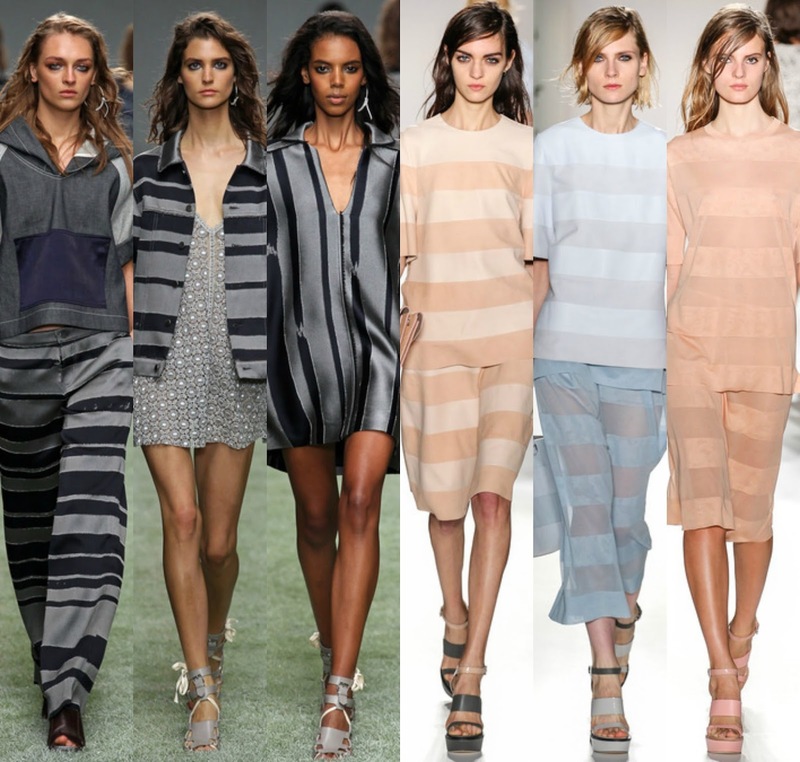 Sheer panels as stripes on simple neutrals are definitely a match made in couture heaven. 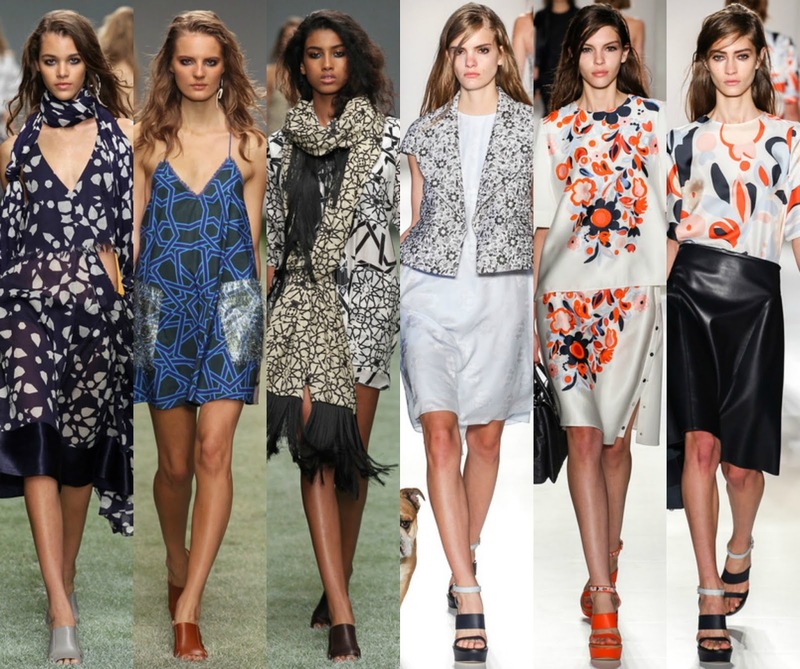 Also one of the major trends of F/W 2013, this calming shade has sashayed down the runway at Topshop and Mulberry this season. 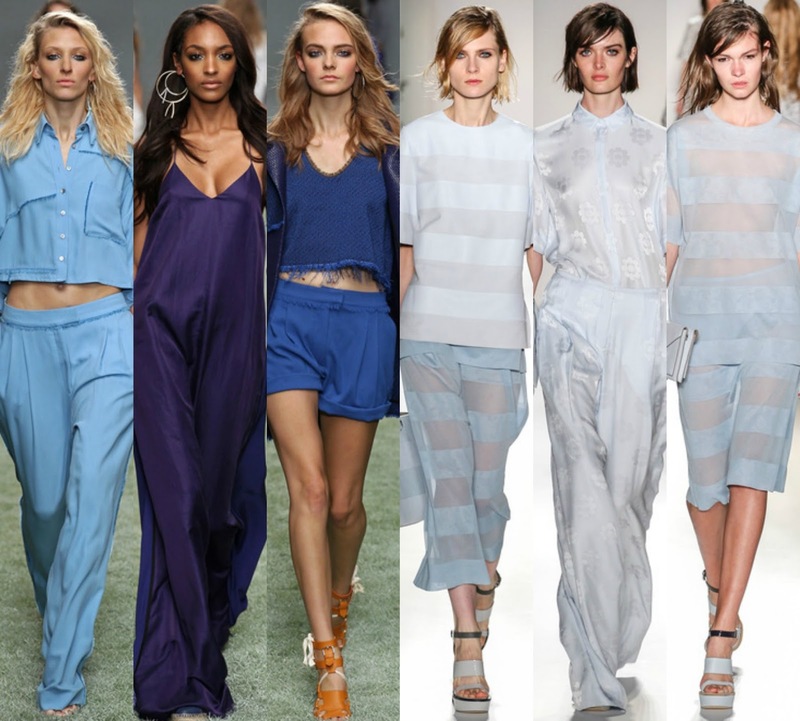 From midnight blue to pastel blues in both shows, the labels were clearly in love with this hue. Whether is it a midriff-baring top or a spaghetti gown, or on loose flowy pants and tops, blue has definitely made its mark as one of the most versatile colour yet. The Verdict : Topshop. Their cropped pajama tops in electric and light blue are to-die-for, and who could resist that indigo back-baring maxi sundress on Jourdan Dunn? 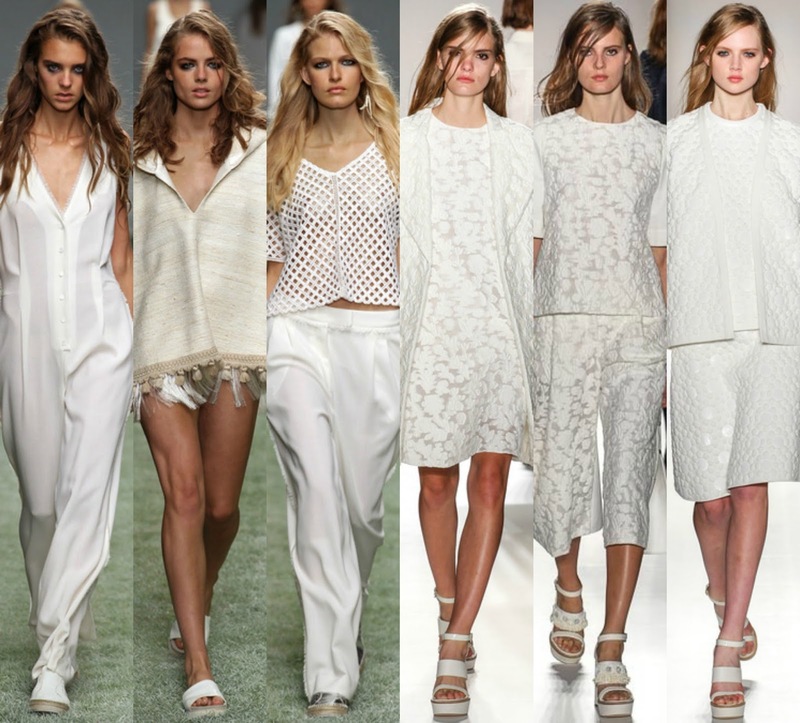 Practically every show of the S/S 2014 season has at least a couple of all-white looks, and Topshop and Mulberry were not surprisingly also on board the all blanc bandwagon. (For Mulberry, even the backdrop was white!) From head to toe, the models above were decked out in white, bringing a refreshing touch to the runway. Sheer, lace and loose fitting pants were some trends spotted among the sea of white here, and it's versatility on different styles goes to show that white still is still very chic. The Verdict : Topshop. The netting-like white top and loose-fitting jumpsuit are definitely some Resort-worthy pieces, and white is a great colour to go with I-spent-all-day-tanning skin. What I love most is the frayed oversized jacket on upcoming model Rosie Tapner. The material is both unique and gorgeous and I can totally see it worn by many a street style star. Aimee Song anyone? Prints have always been a designers' favourite for its knack of bringing personality and whimsy to the pieces and this season, printed togs have rocked the runway for both Mulberry and Topshop. Topshop's collection had an undeniable ethnic feel to them, with star-spangled prints in blue, white and black as well as falling white Rose petal prints on deep blue dresses. While at Mulberry, the daisy prints were evident in the show. There were the monochrome ones on outerwear at the start of the show and orange and black daisy prints on a number of silk jacquard pieces. The Verdict : Mulberry. Their daisy prints just remind me of the quintessentially British lifestyle, just sipping tea or having a picnic in a gorgeous meadow in the countryside. And there even was a fashionably dressed pug which made not one, but two entrances in the show. How cute is that?